I haven’t played Pokemon Black OR White, but Locke has and he assures me that this is an event that occurs. Apparently there’s a fight with a Gym Leader’s Pokemon that has certain similarities with Whitney’s Milktank. 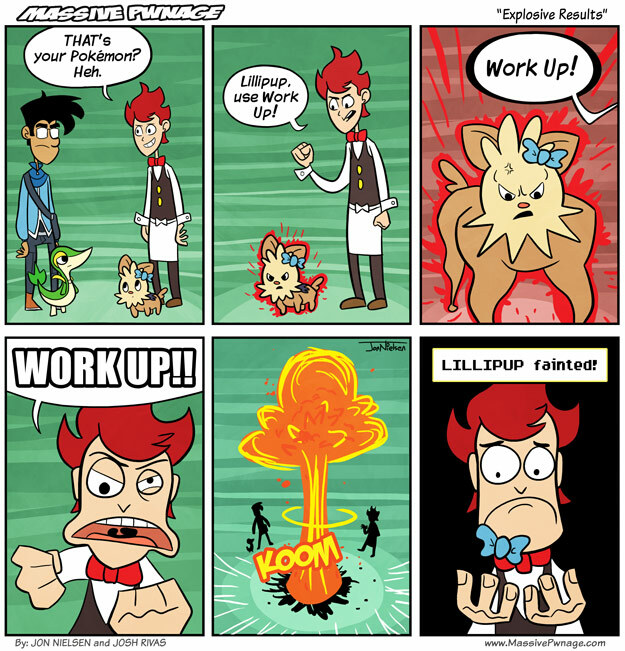 This Lillipup won’t destroy your Pokemon with increasingly more powerful Rollouts, but it will Work Up to unbelievable levels of strength. Locke beat it with Sand Attack. This entry was posted on Friday, April 15th, 2011 at 12:00 am and is filed under Comics. You can follow any responses to this entry through the RSS 2.0 feed. Both comments and pings are currently closed. I got a Black ROM and yes he makes his dog and monkey thing do a full on workout session….from HELL!….I also beat it with Sand Attack from my Purrloin (and also had a Snivy). Stat boost moves don’t become really scary until you get to the 8th gym. Then there’s quiver dance… that move is just silly. The first gym was incredibly easy to beat, i defeated both pokemon before they began hitting me. The leader has a tendency to use work up endlessly until the stats are maxed. My first gym problem was with the second gym leader. Not only does Retaliate deal massive amounts of damage, her pokemon usually go first, and Retaliates power doubles if the previous pokemon just feinted. I return from the dead to make comment on this post…. I have only played against Chili and the grass-type leader, but I’m assuming Cress is the same way…. they will spam work up until their pokemon is almost dead and then try to own the crap out of you with it. It’s really not that big of a deal (you can beat their monkey about 9 times in 10 with your monkey provided your monkey is full health and at least the same level as when you got it) unless you are running a Nuzlocke, in which case I would recommend having a pokemon of around level 14ish to kill the Lillipup (letting the gym leader get a potion in is highly recommended as it means you don’t have to worry about him using it on his Pansage/pansear/panpour). The Striaton city gym is pathetically easy compared to any other first round gym I have seen, to be honest. The trainers you have to fight before you get to the gym leader are actually slightly harder than the gym leader, imo. The first gym was fairly simple, considering the game gives you the exact type advantage. I swear Black/White is so much easier that the originals. Black/White are easy enough… right up until you reach the end of the game, probably with pokemon around level 50. Then you fight a jerk with level 60s. That are fully evolved dragons and such. And then realize that every trainer in the west half of the continent is using level 60s. It is Throh, and i tried Throh, Sawk, and Timburr against the second gym leader, she one-shot each of them with retaliate, or used hypnosis then killed them with retaliate. I found that having Roggenrola use iron defense until his defense stat was maxed and then destroying her with rock black to be very effective. I was able to beat her with my pokemon around level 12-14.